Kaku (Physics/CCNY) is the author (with Jennifer Trainer) of Beyond Einstein (1987) and of several popular volumes on advanced physics. He is also the host of a weekly radio program on modern science. Here, he offers a popular explanation of how the mathematics of higher dimensions underlies modern physical theories, notably the superstring hypothesis of how the universe is put together. The great problem confronting physics has been the building of a bridge between relativity and quantum theory: a single theory reconciling the two extremes of the very large and the very small. Relativity is proven beyond doubt on the scale of planets and galaxies; quantum theory applies to the microcosmic world of subatomic particles. Ever since Einstein, physicists have been trying, and failing, to combine the two into a GUT (Grand Unified Theory). Although it remains controversial among physicists and cosmologists, Kaku proffers superstring theory as the best approximation yet--but it requires acceptance of a counter-intuitive system in which our sensory world, hosting three dimensions of space and one of time, is only a small part of a universe containing ten dimensions (six of them undetectable by our limited senses). Higher dimensions, aka hyperspace, seem to some physicists the most consistent description of the universe we actually inhabit, and to others just one more futile attempt to unify relativity and quantum theory. Kaku admits the futility of visualizing a ten-dimensional universe with our three-dimensional mindset; in fact, he admits that the mathematics of superstring theory are so difficult that many of the key equations remain unsolved. 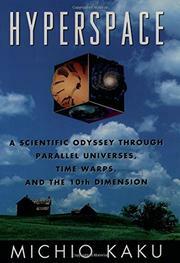 But he effectively marshals examples from everyday experience and the labors of working scientists to illuminate current theories of how the universe really works (to the extent that anyone can understand it without working the equations), offering intelligent speculations on how time travel and faster-than-light travel might be possible. Kaku's explanations of the principles of superstring theory are lucid, lively, and full of entertaining glimpses of the researchers involved. A worthy successor to the popular physics texts of George Gamow, as thought-provoking as Stephen Hawking.